BASSETERRE, ST. KITTS, MARCH 13TH, 2017 (PRESS SEC) — Fifty “petrocasas” houses from Venezuela are being donated to the Federation of St. Kitts and Nevis by President Nicolás Maduro’s administration. The donation will further fuel Prime Minister Dr. the Honourable Timothy Harris’ administration’s ambitious housing plans, which are already underway. Petrocasas are constructed from by-products of Venezuela’s oil refining industry. PVC panels are fitted together on a concrete base then filled with concrete, steel and iron girders to make the petrocasas. 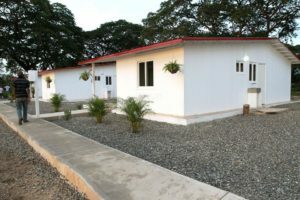 The houses measure approximately 70 square metres (753 square feet) and, in Venezuela, they typically have three bedrooms, two bathrooms, living and dining rooms, a kitchen and a metallic tile roof. 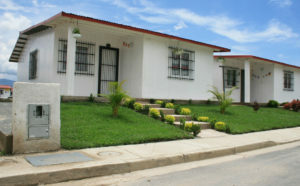 The petrocasas can be assembled in a little over a week and cost close to 50 percent less than conventional homes. Thermal insulation also makes them cooler than conventional homes. On the morning of Monday, March 6th, 2017 during a highly successful meeting in the capital city of Caracas, the Foreign Minister of Venezuela, Her Excellency Ms. Delcy Rodríguez, provided the Prime Minister of St. Kitts and Nevis with an update on the donation of the petrocasas. Mr. Raúl Li Causi, Venezuela’s Vice Minister for the Caribbean, supported the Foreign Minister in the bilateral talks. Indeed, the Team Unity administration is going full steam ahead with its housing strategy. During the launch of Unity Housing Solutions on Friday, February 17th, 2017, Prime Minister Dr. the Honourable Timothy Harris said that the final element of the housing development strategy will involve the installation of infrastructure (electricity, roads and/or water) at 69 already existing housing developments and cost approximately $70 million.